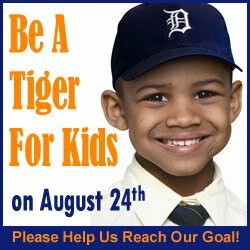 Cornerstone Schools will host the 5th annual “Be a Tiger for Kids” event at Comerica Park on Tuesday, August 24th. This fun-filled, family summer event supports the children of Cornerstone by providing scholarships to prepare students for life and leadership. A special challenge grant issued by The Wheeler Family Foundation and an anonymous donor will provide a $100,000 grant to fund two classrooms of children at Cornerstone if the “Be A Tiger For Kids” event nets at least $400,000. Festivities kick off at 4:30 p.m. at the Rock-N-Roar tailgate party at Ford Field. Guests will enjoy great food, entertainment, face painting, and games for all ages at the exclusive pre-game party. At approximately 6:15 p.m., party goers will collectively make their way to Comerica Park to see the Cornerstone Honors Choir perform the Star Spangled Banner and cheer on the Detroit Tigers as they play the Kansas City Royals. Game time is 7:05 p.m.
Over 50% of the parents whose children now attend Cornerstone are at or below the poverty line and have been negatively impacted by the economic conditions in the city. A donation to the school’s scholarship fund fills the financial gap. Ultimate Fan Package ($250) - sends a child to school for one week per year. Receives one premier game ticket (best seats available on a first-come, first-served basis), entry for one to the private pre-game Rock-N-Roar tailgate and a commemorative event tee shirt. As an ultimate fan, you will be eligible to win a special opportunity to attend batting practice with the Tigers. Fan Package ($100) - sends a child to school for two days per year. Receives a premium game ticket, entry into the private, pre-game tailgate party and an event t-shirt. Receives a game ticket, entry into the private, pre-game tailgate party and an event t-shirt. For tickets, sponsorships or more information, please visit www.CornerstoneSchools.org or call Cornerstone Schools at 1-800-343-0951.